FRANCE: Areva has launched an 8MW turbine with plans for the prototype to be installed in 2015 and serial production to begin in 2018. The machine will have an 180-metre rotor and feature a medium-speed hybrid gearbox. The turbine is based on the French company's M5000. Areva said the 8MW will provide improved productivity, output and installation costs. The 180-metre rotor will be the industry's largest, surpassing the current record-holder, Samsung with 171 metres on its 7MW machine. 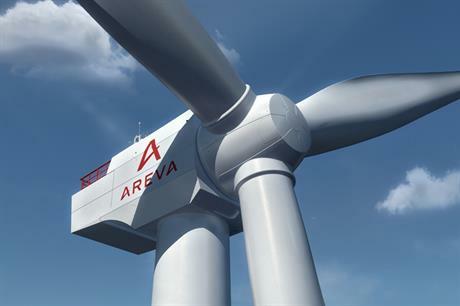 Areva CEO Luc Oursel said the 8MW turbine will be targeted at the UK's offshore market and France's 1GW second round tender for offshore wind farm developments. A test bench for the machine will be set up in Le Havre, northern France. The GDF Suez-led consortium in July selected Areva as its exclusive supplier of wind turbines for France’s second round offshore tender. The two 500MW projects are located off Tréport, in the English Channel, and near the islands of Yeu and Noirmoutier, in the Atlantic. They must come into service by 2023. The consortium said the construction of the two wind farms will create 6,000 jobs. Areva's M5000-116 turbines were installed at Windreich's 400MW Global Tech 1 in the North Sea in September and in July the installation of 40 Areva 5MW turbines began at the 200MW Borkum West 2 Phase 1. Areva was part of the consortium that won the St-Brieuc 500MW first-round tender in France.